I’ve posted about Benjamin Zander before, but it’s always great to see him present again with a live demo for a mini master class! Zander rocks along with Rozie (Zanders inspiration)! Buy his book “The Art of Possibility“. Fritz Panzer creates this oddly creepy but very cool diminishing wire escalator. Yasuaki Chiba rethinks the everyday cloths hanger making it a bit easier to slip that second arm into the shirt. Pretty clever.. I’ll have to try it out. Buy it here. How awesome! Seongyong Lee added a little air bubble to his utensils designs which float them like buoys with handles in the air, and a nice scooper for your punch bowl! Juan Enriquez presents a vigorous 10 point commandment plan to save the US economy for our next president during Pop!Tech 2008. Watch the video here with more info on joining to help out including a pdf of his presentation! 3. All entitlements are fair game. 7. The program has to be fundamentally American, meaning it must once again limit the federal government. – the unusual, suspenseful, mind blowing, amazing!!! Swwweeeeet! IdeaPaint transforms any surface into a dry erase board!!!! Just paint over it, let it dry, and marker board away! I’m wanting to paint every elevator, table, chalk board, ceiling, projection surface, column, sketch book cover, and everything else! It’s also very environmentally friendly, allowing any surface to be easily repainted. Watch a video here and get your FREE sample!!!! If you prefer, you can ChalkBoard your space as well! I found this fish blimp video amusing. A simple change in an object transforms the space surrounding it. Before it was just a blimp floating in thin air. Add some fins and some movement to that object and the space once perceived as air becomes more fluid, thick, and water like. Perception, Perspective, fun…all part of design. Ever since McCain announced his VP to be Sarah Palin there’s been a ton of buzz surrounding her questionable behaviors and background. Anyhoots, someone online made a web page making ya think a bit more about putting her in the white house. So, what would the oval office be like if Sarah Palin took over? Turn up your sound,visit PalinAsPresident.us and click away, even multiple times in the same place! Pretty funny! 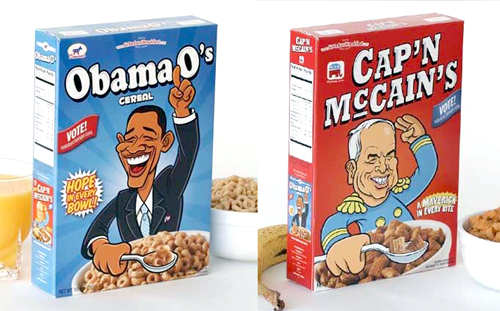 Get your morning box of “Obama O’s” or ” Cap’n McCains” in from the inventive crew at AirbedAndBreakfast.com launching a tasty limited production (500) of election cereal boxes with real cereal, fun facts, a definite conversation starter, and their very own online jingle (Obama O’s Jingle, Cap’n McCains Jingle) . Choose from the political flavors of “Hope in Every Bowl”, a “Maverick in Every Bite”, or both if your seeking a taste in history. A box of these goodies cost $39 with 5% of the sales to each campaign. I took a few pics with Joe after the jump… including my Freshmaker selection!